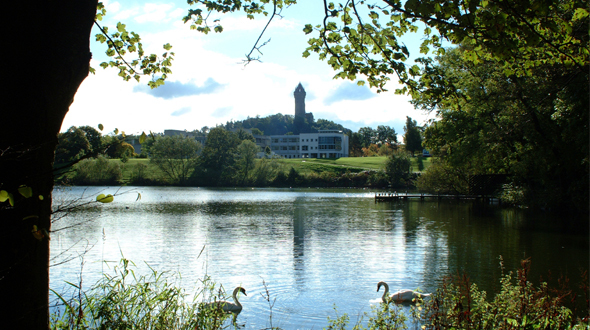 The University of Stirling has high student satisfaction levels, a staff who enjoy their work and are committed to investing in your future and an excellent employability rate for our graduates. Quality of Choice - Choose from approx. 200 high quality undergraduate degree combinations to create the course that will suit your strengths and help you achieve your goals. We have a wide selection of taught Masters Degrees and Post Graduate programmes. These accredited courses allow applicants to gain awards including MSc, MLitt, MEd, MRes and MBA degree qualifications. Leading Research – According to the most recent Research Assessment Exercise (RAE, 2008) several of our academic divisions are rated top in Scotland for research – you'll have access to cutting edge developments in your field. Latest Technology - With wireless hubs throughout the campus and accommodation there’s no excuse not to stay in touch! Central Location - Edinburgh, Glasgow and the Highlands are all on your doorstep – Stirling really is at Scotland's heart. Cracking Nightlife! - Stirling's a friendly, buzzing and youthful city, with lots to do. One in every five residents is a student. Superb Sport - We have some of the finest facilities on a single site in the UK. No wonder we've been named Scotland's University for Sporting Excellence. 19 Sep 2018 University of Stirling University of Stirling will be visiting Nigeria! 25 Jun 2018 University of Stirling University of Stirling will be visiting Nigeria! 08 May 2018 University of Stirling University of Stirling will be visiting Ghana! 02 May 2018 University of Stirling University of Stirling will be visiting Nigeria! 05 May 2017 University of Stirling University of Stirling will be visiting Nigeria!